I have been making this recipe so long that the recipe page is now sandwiched between two layers of packing tape so that it will not deteriorate any further! I got the recipe from a Tupperware dealer when Ultra21’s were all the rage! I loved those so much! I have long since lost the Ultra 21 and now use a 10″Springform pan instead. I like how easy it is to serve from a Springform pan and how easy a Springform is to clean! Prepare a 20″ Springform pan by spraying with Vegetable Oil Spray and lightly dusting with cornmeal. Or use the same size Quiche pan. In mixing bowl, combine flour, baking powder and salt; cut in butter until mixture resembles coarse crumbs. Add yogurt and stir until the dough comes together. 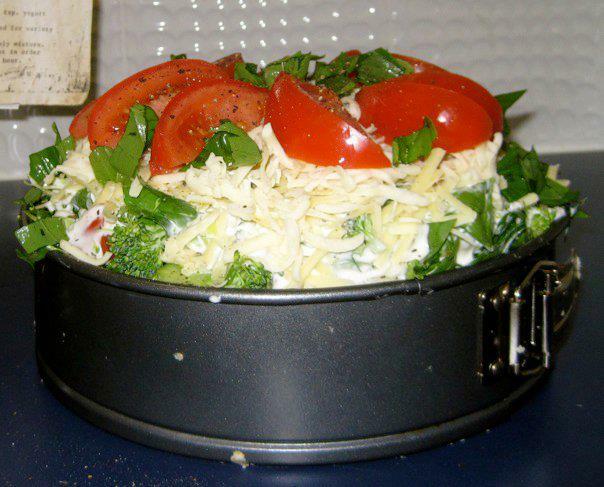 Press the dough into prepared baking pan and, if using a springform pan, halfway up the sides. Layer filling over crust in order given. In a small bowl combine 1/3 cup Mayo and 2 Tbsp Plain Yogurt; spread this over the Vegetable Filling. Bake at 450F for 10 minutes; reduce heat to 350F (175C) and bake for another 30 minutes. Remove from oven, let stand for 15 minutes, serve. The Lentil Loaf recipe that I found eons ago in a Canadian Living magazine is a versatile staple in my Vegetarian lifestyle: sometimes I bake it in a loaf pan, make a Cashew Nut Sauce to go with it; sometimes I scoop the mixture into a muffin tin for single serving portions, wrap ’em up, freeze ’em and use ’em when I need ’em; and finally, my fave, I use it as a base for Shepherd’s Pie. Heat olive oil in a medium size saucepan with tight fitting lid. Cook onion in heated oil for 2 – 3 minutes; add garlic and continue cooking for another few minutes. Stir in lentils until coated. Reduce heat and simmer, covered for about 30 minutes until lentils are tender. Remove from heat, stir well, mashing any whole lentils remaining. Stir in lemon juice, bread crumbs, tomatoes, basil and salt, water and egg, if using. Preheat oven to 350F now. Prepare an 8x4inch loaf pan; spray lightly with vegetable oil spray. If making Shepherd’s Pie, top Lentil Mixture with a layer of Frozen Peas or Frozen Mixed Vegetables and top with Mashed Potatoes. 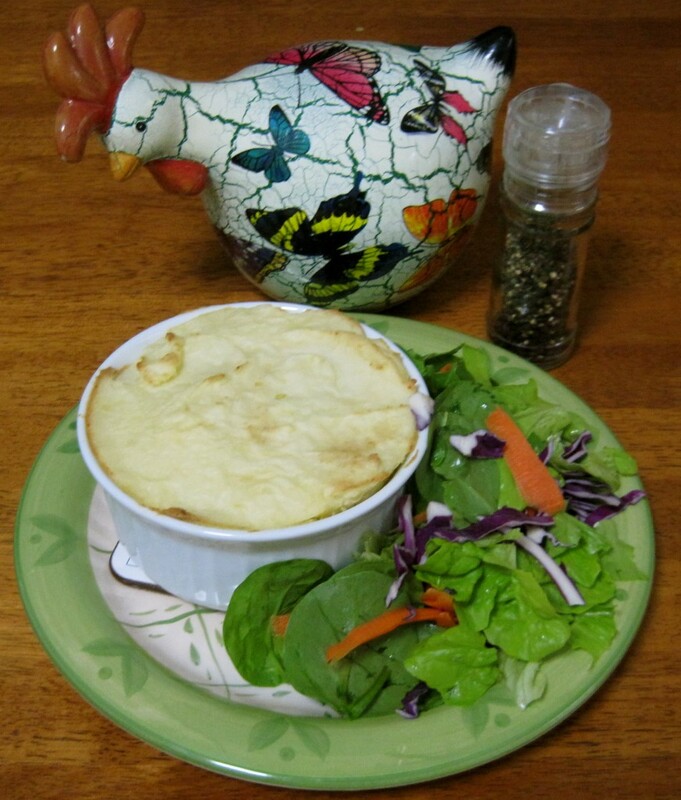 Shepherd’s Pie – 35 – 45 minutes, until Lentil layer is Bubbly and Potato topping is golden. I parboiled some baby potatoes, drained, sliced and threw them onto a layer of Frozen Peas on top of the Lentil Mixture. 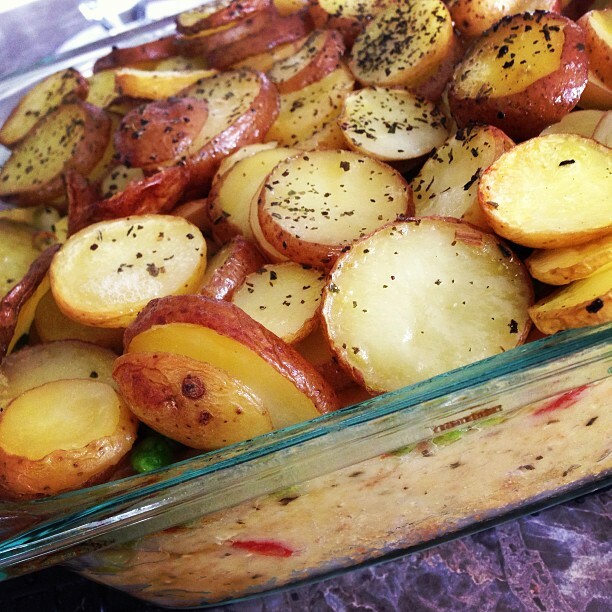 Before baking for 30 minutes, I lightly brushed the potatoes with some melted butter and sprinkled the whole thing with fresh ground Pepper and a bit of dried basil. I had some carrots that were no longer eye appealing and needed to be used up. I absolutely love to bake but, oh my, there is only so much baking one can consume! Summer has been a busy time for everyone so we haven’t had our regular Sunday Dinners where I can rely on the help of extended family members to empty the Cookie Jar or Cake Platter. Still, here I have all these grated carrots begging to be made into something, not just relegated to the deep, dark realms of the freezer which is now chock-a-block full of summer berries. 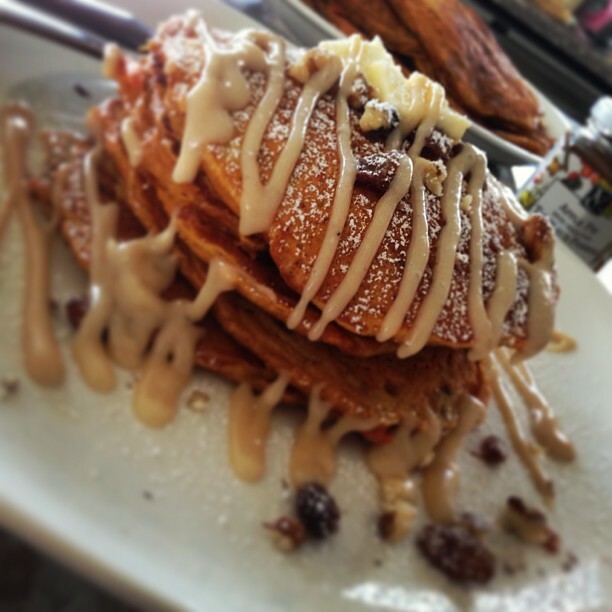 Well, you may or may not know that I discovered Cinnamon Roll Pancakes which are definitely less sinful than Cinnamon Rolls sooooo… I got to thinking you have to be able to make Carrot Cake Pancakes! Woot! All that yummy goodness with a fraction of the calories! I like to make extra Pancakes when I have the griddle heated and freeze the leftovers so we have Toaster Pancakes on busy work day mornings. If you don’t have buttermilk, set the milk to souring before you begin. Melt the butter and let it cool while you proceed with getting your dry ingredients combined. In small mixing bowl beat cream cheese until smooth. Add icing sugar and vanilla, beating until no lumps remain. Add a little milk (1 – 2 Tablespoons) if you want a thinner drizzle. In mixing bowl combine flours, baking powder, baking soda, salt, spices and brown sugar. Stir in chopped nuts and raisins. In a small bowl, combine buttermilk, vanilla, eggs, melted butter and grated carrots. Pour liquid ingredients, all at once, into dry ingredients. Stir just until all the flour is incorporated, do not overmix. Lightly spray griddle with non stick spray. Ladle about 1/4 – 1/3 cup for each pancake, spreading the batter slightly ; cook for 3 – 4 minutes, until bubbles start to pop and edges are dry. Flip over and continue cooking for another 3 – 4 minutes. Serve warm with Cream Cheese Drizzle. Freeze any leftovers and simply pop into the toaster to reheat when needed. FYI – This is a ummm, goopy batter; don’t try to hurry these up by cranking up the heat coz you will end up with burnt outsides and raw insides…YUCK! Keep it at 350F and practice patience…or you know, clean all the surfaces in the kitchen if you are like me and can’t be trusted to be patient! Alright, so normally I look at a recipe, think about the flavours, presentation, etc and then change it up to suit our needs. I must confess, having been, and continuing to be a Vegetarian for over 30 years, I feel like a fish out of water when it comes to cooking Meat products which is why I followed this recipe for Chicken Bombs, pretty much to the T.
Chicken Bombs with an Explosion of Flavour in every bite! Combine cream cheese and shredded cheese together and set aside. Slice Chicken Breasts in half. Place between wax paper and pound until about 1/4″ thick. Spread about 1 Tbspn of cream cheese mixture onto a strip of jalapeño and place on chicken breast; roll up to wrap completely – repeat with each chicken breast. 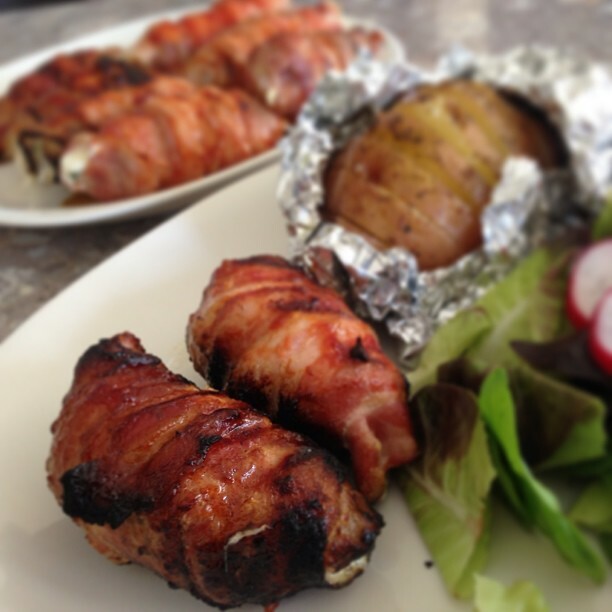 Wrap each chicken breast with two strips of bacon each, starting at one end of chicken breast and working your way along to cover the entire thing with bacon. Cook on preheated 350F Grill over indirect heat, turning over every 5 minutes, brushing with BBQ sauce each time, for about 30 minutes or until chicken is done – when pierced with a fork the juices run clear. Bake in 375F oven for 30 minutes or until chicken is done. Turn midway through cooking time, baste with BBQ sauce. At the end of the cooking time, turn oven to Broil and Broil for about 3 minutes. When Ryan goes to the shops to get a few things to make lunches with, he invariably comes home with way to much bread! He bought two packages of lovely panini rolls because they were on sale…well, we can only eat so much fresh bread between the three of us. The lovely panini rolls were growing older by the day; on Day Three I simply had to rescue the remaining 6 rolls. And not just to the freezer where they would be forgotten and probably thrown out 4 months down the road! I also had some apples that were becoming less and less eye appealing by the day; the answer to my problems, Apple Bread Pudding but with summer temperatures preventing me from wanting to turn the oven on…haul out the slow cooker. 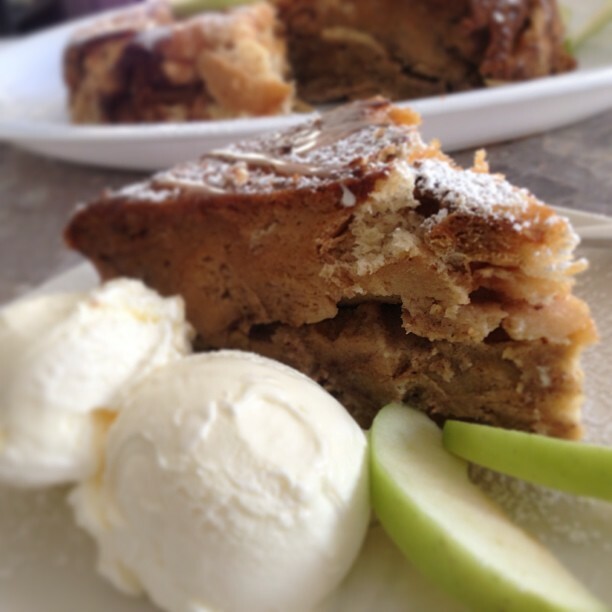 I found this recipe for Slow Cooker Apple Bread pudding with many thanks to Google. However, I didn’t want choc chips in my bread pudding and I skipped the Yogurt Sauce found in the original recipe. Coat slow cooker insert with butter or margarine. Add remaining bread, top with remaining steamed apples, sultanas and chopped pecans. In a medium bowl combine eggs, milk, condensed milk, and spices; pour over bread, fruit and nuts, pressing down with a spoon to completely moisten all the bread. Cover and cook on LOW setting for 3 – 4 hours, or until knife inserted in the centre comes out clean. Start checking the bread pudding after three hours and check every 15 minutes afterwards until cooked through. Serve with fresh whipped cream or ice cream. 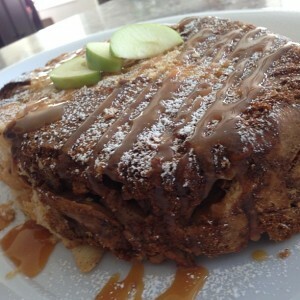 FYI – This is sort of like having French Toast for breakfast right? I put the leftovers in the freezer and pulled out a serving out each day for a week for my instant breakfast!